Squash bug nymphs huddle just after hatching from their eggs. An interesting thing about the English language is that many words have dual meanings. The Encarta dictionary attached to my word processor defines squash as a noun meaning “vegetable of the gourd family” and as a verb meaning “to crush something with pressure.” Both definitions are directly relevant to this Bug of the Week. Here is what I mean. Squash, zucchini, pumpkins, and gourds are all members of the cucurbit family. Humans are not the only ones that find these prickly plants delectable. In a previous episode of Bug of the Week, we met the dastardly squash vine borer, a caterpillar with the power to wilt even the toughest pumpkin vine. While admiring some squash vines the other day, I noticed several plants with severely wilted leaves and vines. 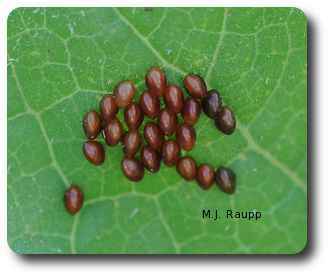 Clusters of squashed bug eggs can be crushed or plucked from the plant. After inspecting vines and finding no evidence of bad borers, I turned over a few leaves and found nymphal and adult squash bugs merrily sipping sap. Squash bugs are members of the true bug clan meaning they have an elongated beak for sucking liquid food and, as juveniles, they are known as nymphs. We met other members of this cantankerous clique including bed bugs, brown marmorated stink bug, boxelder bug, and wheel bug in stories past. Both nymphs and adults consume fluids from their cucurbit hosts and problems arise when squash bugs jab their proboscis into the vascular system of the plant to withdraw nutrients. Inserting the beak damages the piping of the plant. This injury and removal of vascular liquids cause plants to wilt. Older squash bug nymphs turn a ghostly white. When squash bugs are abundant, their damage can reduce the bounty produced by your squash and zucchini vines. Fortunately, there are a few tricks you can use to foil the squash bug’s shenanigans. At the end of the year, rid your garden of decaying vegetation and remnants of vines and leaves. These refuges are used by adult squash bugs to survive the wild winter. In spring, plant varieties such as Butternut, Royal Acorn, or Sweet Cheese that are more resistant to squash bugs. I have spoken to gardeners who place fabric row covers over their plants early in the season to help keep these buggers from colonizing their plants. If you go this route, remember to remove row covers when blossoms first appear. If you don’t, then pollinators cannot do their job. No pollination means zero pumpkins, squash, or zuccs. Finally, if you see squash bugs, squash the squash bugs. Really, if you have just a few plants, it is relatively easy to inspect plants and when you find the golden or amber eggs, whitish nymphs, or tawny adults, crush them or remove them from the plant and treat them with extreme prejudice. Bug of the Week thanks the marvelous Master Gardeners of Montgomery County who were the inspiration for this episode. To learn more about squash bugs, please visit the following web sites.